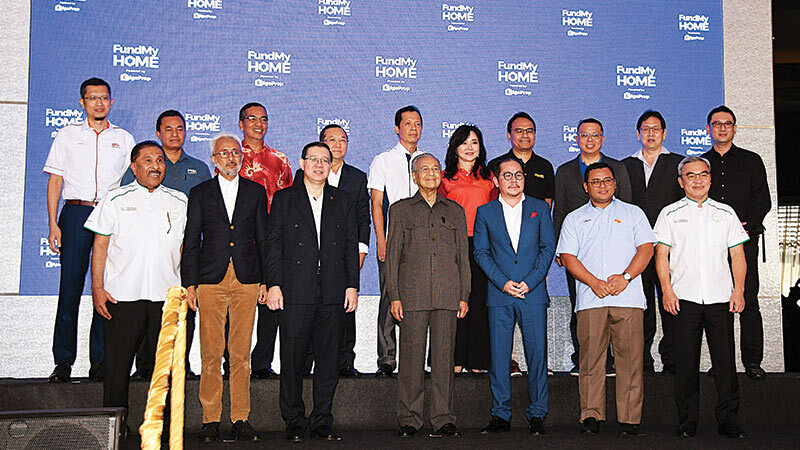 A first-of-its-kind property scheme — FundMyHome.com — was launched on Nov 4 by Prime Minister Tun Dr Mahathir Mohamad, together with The Edge Media Group chairman Datuk Tong Kooi Ong, at EcoWorld Gallery in Eco Majestic, Semenyih. This scheme aims to help first-time homebuyers own their first home. The prime minister believes the scheme can help the new government reach its target of one million affordable homes within 10 years, which the Pakatan Harapan coalition had promised in its election manifesto. “It has been a phenomenon that there are too many people who can’t afford a home due to their inability to get end-financing while there are many completed houses left empty,” he said in his speech at the launch. The government, he said, is in support of schemes that will help more people own a home with minimum payment. FundMyHome.com is a platform developed by EdgeProp Sdn Bhd and is open to Malaysian residents 18 years and above who are first-time homebuyers. Through this platform, buyers will need to pay 20% of the selling price upfront while the remaining 80% will be funded by investors through FundMyHome.com. The unit will be owned solely by the buyer, who will sign a sales and purchase agreement. There is a fixed commitment period of five years and throughout this period, the buyer can choose to stay in the property or rent it out. At the end of the five years, the buyer can choose to either buy the remaining 80% of the property or sell it. If the buyer decides to sell, the developer will receive 20% of the appreciation in price while the excess of the profits will be distributed between the buyer and investors. If the buyer decides to buy, he or she can either refinance the property through a normal home mortgage with a bank or roll over the scheme again through the portal. The house price will be based on the value, to be assessed by an independent valuer, six months before the end of the five-year period. FundMyHome.com is the security agent and will collect 100% of the purchase price. It will pass on 80% to the developer, with the remaining 20% held in a trust account managed by a third-party independent trustee company, to be appointed by FundMyHome.com. Investors can expect an annual 5% fixed return based on their investment for the duration of the five years. The 5% return will be funded from the 20% paid by the buyer. The investors will only receive any profit at the end of the five-year period, when the property is sold or refinanced, if the property value appreciates. As of now, only institutional investors may participate as the funding platform for the public, known as the Peer-to-Peer funding platform, has yet to be approved by Securities Commission Malaysia. “This platform is necessary because it involves funding from the public and we cannot do it because there are all sorts of compliance, regulations, protection of investors’ right and so on. The SC is working with us to try to amend the necessary framework, guidelines, regulations and so on,” said Tong. Once the public funding platform has been approved, the public can participate as individual investors, with a minimum investment of RM5,000. At the moment, there are two investors — Malayan Banking Bhd and CIMB Group Holdings Bhd. As for the developers, they will get 80% upfront cash and the remaining 20% will be deferred to the end of the five-year period if the property price goes up. So, developers that put up their properties on this platform have to be confident that their products will appreciate in value over time, said Tong. Currently, there are nine participating developers offering about 1,000 homes priced below RM500,000. All homes offered on FundMyHome.com are completed or nearing completion, enabling buyers to move in soon after the buying process is done. The developers are EcoWorld Development Group Bhd, IJM Land Bhd, IOI Properties Group Bhd, Mah Sing Group Bhd, Perbadanan Kemajuan Negeri Selangor (PKNS), PNB Development Sdn Bhd, Sunway Bhd, Trinity Group Sdn Bhd and UEM Sunrise Bhd. The following is an example to further explain the process. A buyer is interested in a house that is selling for RM500,000 through FundMyHome.com. He or she will then pay 20%, or RM100,000, upfront while the remaining 80%, or RM400,000, will be contributed by investors. The buyer will then sign a sales and purchase agreement and have full ownership of the property. This scheme allows the buyer to own a home mortgage-free for five years. The 20% can be funded through personal savings, personal bank loan or withdrawal from the Employees Provident Fund (EPF).